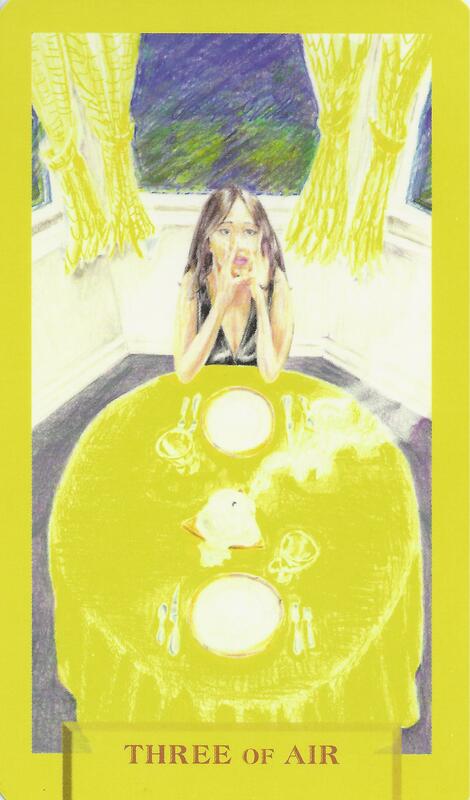 The Threes from Today’s Journey Tarot all symbolize a moment of realization. Three is the number of things coming together – one plus two equals three. Depending on the Element it can suggest understanding, celebration, creation, or success. It is the result of whatever effort has been made. The Three of Fire for example, shows the lighting store we saw in the Two of Fire. It is now a viable business with customers and employees. The success of opening the business has gone even further into maintaining that success and building on it, using the strength and ambition of the Fire Element. The dream was realized in the Two but what was created there has been maintained and energized to enhance the reality. 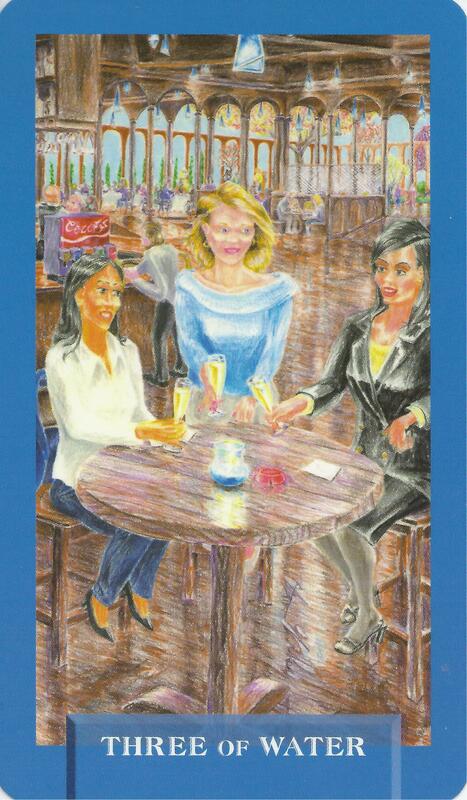 The Three of Water is a celebration card. The women are out enjoying their time together and toasting the occasion. Perhaps they are celebrating someone’s promotion at work or engagement or just the fact that they have come together in companionship. They acknowledge their friendship and share their happiness with each other. They physically come together to do this but the realization here is based on the emotional, nurturing, and supportive nature of love. The Three of Air shows a disappointed young woman who has obviously been stood up. She has prepared the perfect setting for her date, donned her “little black dress” and waited for someone who did not come. This is a moment of understanding. He is not going to show up and probably this is the end of the relationship. Perhaps she read too much into a friendship or chose someone who just wasn’t interested in her. Whatever the reasons this is the result of misunderstanding and her expectations. The situation is now very clear and it is time to move on. The Element of Air can sometimes fool us into believing what we want to believe. The Three of Earth uses the Element to create. 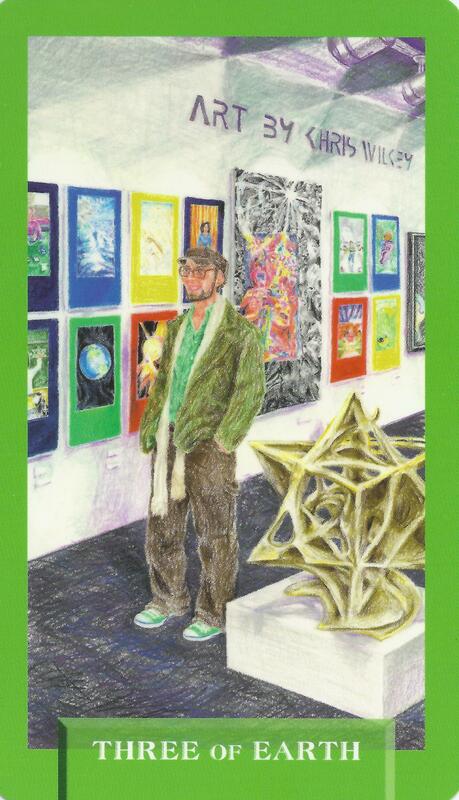 This card shows an artist; in this case the illustrator of Today’s Journey Tarot, Christopher Wilkey, at a gallery showing of his work. Chris spent countless hours with us (Expanding Dimensions) as we described each card and then many more hours creating each piece of art for the deck. His dedication and talent channeled our ideas into Today’s Journey Tarot. The commitment was huge but he never wavered from it. Accomplishment and recognition are the results of confidently expressing your talent.